Towing a Conway tipping trailer offers the best of both worlds. 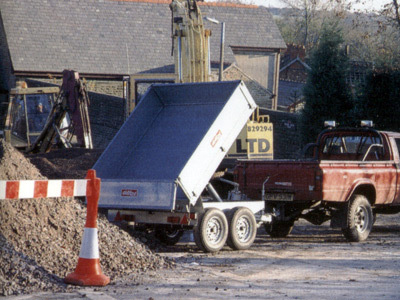 First and foremost, it is a proven workhorse designed to make light work of transporting or unloading difficult to handle bulk loads such as earth, sand, gravel and other loose material. 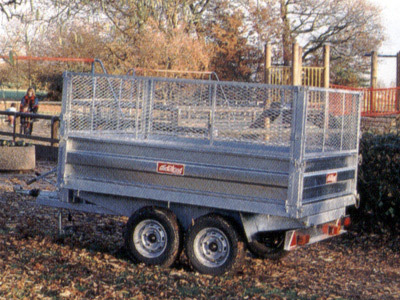 This trailer has a very useful tipping angle of 55 degrees, achieved by the use of a heavy duty 2 stage ram. Unloading is quick and effective, using either the quick action hand pump or optional electric pump. It is also equally at home working as a versatile, general purpose trailer that can handle a wide range of non tipping applications. 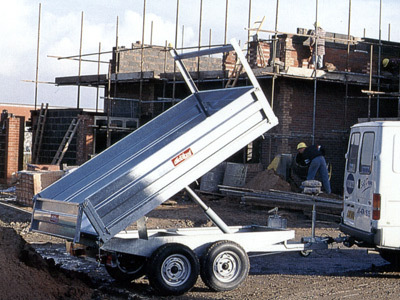 With a ladder rack fitted as standard, the trailer can easily carry long loads, whilst hinged removable sides enable sheet and palletised materials to be carried with ease. This remarkably versatile trailer from Conway is available in a choice of both 6ft and 8ft body lengths, on either single or twin axles. One piece galvanised floor for easy cleaning and slideability. 55 degree angle of tip. In line relief valve so tipping mechanism cannot be overloaded. Drop down sides for easy loading. Wheels under body ensures that trailer body is no wider than towing vehicle. 12v/manual pump option with on board battery.